Here I finally explain what a comicsperiment is. It’s a medium, not a genre! Since I’ve been making comics as a ‘comicsperimenter’ for some time now, I thought it would be good to explain it a little. And what would be a better way to do so, then in comic book format? Here you see me explaining that comics are a medium, not a genre. And that, as a medium, it covers a wide range of genres and styles. Like, for instance gag comics , superhero comics, underground comics, autobiographical comics and so on and so on. But that all of these are mere GENRES within the MEDIUM of comic book art. The most interesting thing, to me at least, is that comic book art itself has a couple of very interesting qualities imbedded in the medium. The way text and imagery work together to create something more than the sum of its parts (see my previous experiments with word balloons). 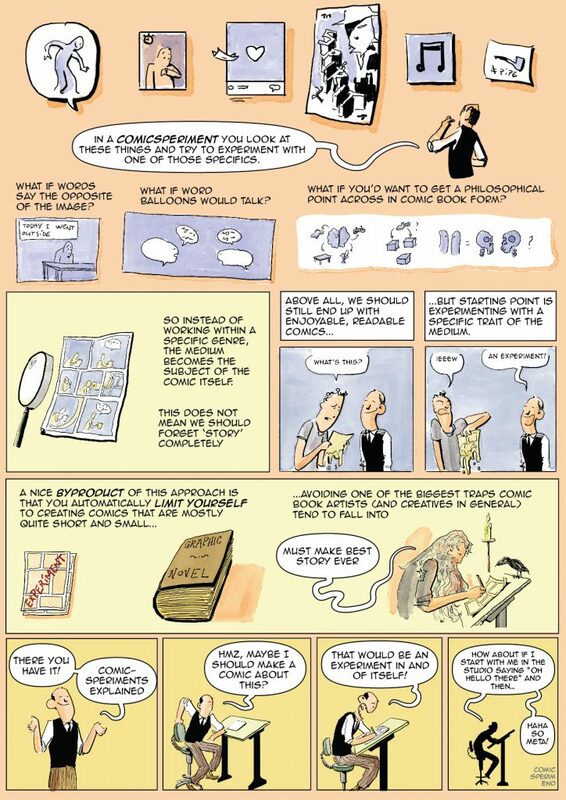 Then there’s the way panel size influences timing (Scott McCloud talks about this quite a bit). How page layout can be used to evoke a certain message and guide the readers eye (Will Eisner was a master at this). And then there’s the way publishing on a digital format like Instagram forces you to think differently about all that went before (more on that later). And there are countless other things of course, like the way panels create a certain kind of rhythm (almost like music). Or how a flat image, drawn in ink becomes something we attribute meaning to quite easily. In a Comicsperiment you take all these things and try to experiment with one of those specifics. What if the words say the opposite of what the images show? What is word balloons would talk? What if I’d want to get a philosophical point across in comic book form? 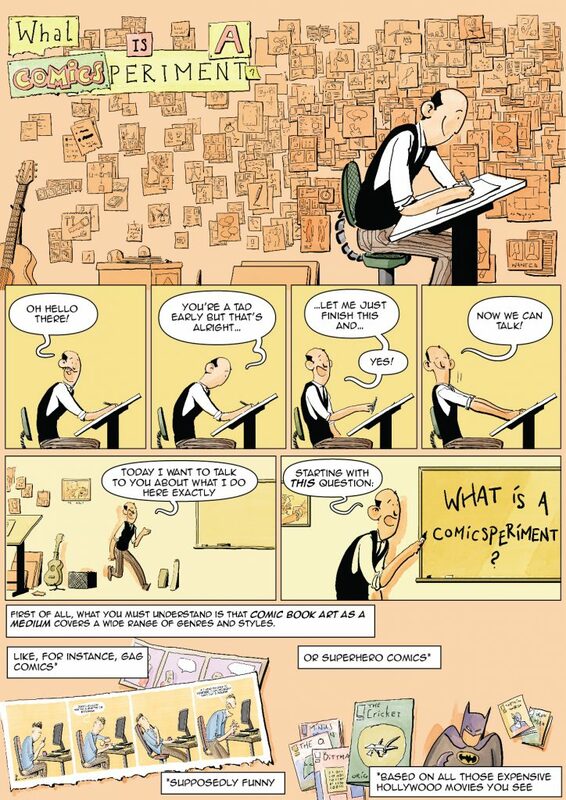 So instead of working within a specific genre, the medium itself becomes the subject of the comic. This does not mean we should forget ‘story’ though! Above all, we should still end up with enjoyable, readable comics. But starting point is experimenting with a specific trait of the medium. A nice byproduct of this approach is that you automatically limit yourself to creating comics that are mostly quite short and small. A lot of artists want to make a huge impact. Create the biggest best work ever created in the history of mankind. And that is very admirable of course. But I myself found it also very frightening and paralyzing. While in doing ‘a little fun experiment’ can trick the brain into thinking this is something not worth getting paralyzed over. It’s a great trick and works wonders for me! As I mentioned, one of the modern challenges on publishing your comics online is the different image sizes that different media (let you) use. For instance, on Instagram the best images to use are square ones. When making this comic, I did it completely ‘in squares’ so I wound up with ten square panels (head on over to my Instagram account to swipe through it!). Because I wanted to publish it here on my comicsperimenter blog as well, I was looking for a way to create a more traditional looking page out of them. I ended up cutting up nearly every panel so I could rearrange them into the three pages you’ve read above. It was quite a task, but I think it was worth it. It is important to keep in mind that even back in the newspaper heydays people like Milton Caniff and Will Eisner created multiple versions of their work to suit the layouts of the different papers they published in. 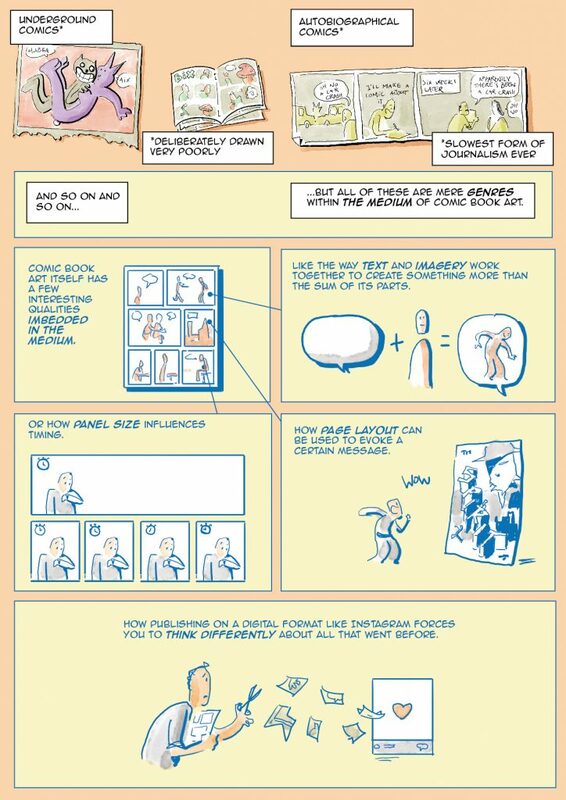 I think this is an overlooked and very interesting aspect of creating comics in the digital age. I’ll probably look into it more down the line. As always, I’m curious to hear your thoughts. • Which version of the comic do you prefer, the Instagram one, or the full page one? • Any comic-specific qualities I missed?